The next type of cartridge we will study is the rimfire cartridge, which was developed around the same time as the pinfire cartridge. The principle of these cartridges is similar to that of the percussion lock (i.e.) use a hammer to strike a blow on some shock sensitive priming material (such as mercury fulminate or potassium chlorate), which then ignites and lights the main gunpowder charge. The rimfire cartridge was originally developed in the 1830s, but the first practical rim-fire cartridge only came out in 1845 for a .22 caliber ball-bearing (BB) Flobert. This weapon used no gunpowder, but simply used the power of the explosion of the priming material to propel the bullet (which was a spherical ball-bearing). It was only used for shooting clubs since it was a very low powered weapon. The next advancement was due to Smith and Wesson, who produced a popular .22 caliber revolver that used rimfire cartridges in 1857. In fact, this was Smith and Wesson's very first revolver model and the cartridge for this weapon was called the ".22 short" due to the bullet being .22 caliber. Due to the success of the revolver and its ".22 short" cartridge, they soon produced a ".22 long" cartridge in 1871, which was originally intended to be used by revolvers. The ".22 short" and ".22 long" use the same bullet, but the ".22 long" is in a longer case and contains about 20% more gunpowder. A separate manufacturer (J Stevens Arms & Tools Company) took the ".22 long" and added a longer (and heavier) bullet to make a rifle cartridge called the ".22 Long Rifle", popularly known as the "22LR". Even though rimfire cartridges were produced in other larger calibers, the .22 caliber is the one that has been the most successful. The success of the ".22 long rifle" cartridge can be seen in that it is still in production to this present day and is the most common rifle cartridge. In fact, almost every weapons manufacturer of cartridge weapons in the world makes at least one model that uses the 22LR. To fire this, one must strike the rim of the cartridge with a sharp blow. The shock-sensitive chemicals inside will detonate with the force of the blow and spread the flame throughout the gunpowder, thereby discharging the bullet. The hammer is positioned in such a way that it strikes the rim part of the cartridge alone. This design provides a very tight seal, so that excess gas cannot escape through the back of the weapon. Note that the material on the rim of the cartridge has to be somewhat thin so that it can be deformed by the hammer to detonate the cartridge. To load the weapon, the user merely opens the breech, takes out the old fired cartridge (if it exists) and replaces it with the new cartridge. Unlike a pin-fire cartridge, there is no need to position the cartridge in a special way, as it is symmetrical and the priming compound is present around the entire rim of the cartridge. It is a very cheap type of cartridge and ideal for mass production. In fact, it in the early 2000s, it only cost $10 to buy a box of 500 "22 long rifle" cartridges. This makes rimfire weapons a favorite of shooters on a budget. Unlike a pinfire cartridge, the rimfire cartridge does not need to be positioned specially in the weapon. Gas seal is relatively tight, so gas does not escape through the back of the weapon. This cartridge needs a thinner case at the rim so that the hammer can deform the case and detonate the priming material. This means that the cartridge itself cannot withstand too much pressure and can only be used for low-powered weapons. 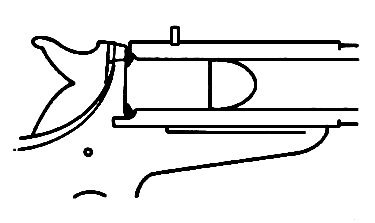 Once the cartridge is fired, the cartridge cannot be reloaded at home, due to the deformation of the rim. Due to the low-power nature of the cartridges, weapons that fire them have less recoil. Hence, they are ideal for training beginning shooters. They are also used by air marshals aboard aircraft, since they have less chance of piercing the aircraft skin. Conversely, due to the low-power nature of this type of cartridge, rimfire cartridges of larger calibers (such as .44, .41 etc.) were quickly replaced by centerfire cartridges, which we will study about in the next post in this blog. This is because centerfire cartridges can withstand higher pressures and are more suitable for high powered guns.